We are working on an exciting renovation in Sydney, Cape Breton at the moment, converting a doctor's office into a two bedroom loft-like apartment. Demo started last week. Here is a sneak peek of what the final result will look like. Not a bad location for a sauna, just steps from the Atlantic Ocean! The building is separated into two rooms; a small change room at the front, facing the bold Atlantic and the sauna itself at the back. The sauna is heated by a Harvia through-the-wall wood stove which is accessed from the change room. Another successful prefab solution. Great article in the Chronicle Herald on the QuarterDeck Beach Lofts. Check it out HERE. We are excited about our new website design by Angie Hodder. Stay tuned for new project updates. The new site will showcase them nicely. A few progress pics from this weeks site visit to the Lake House in beautiful Cape Breton. The crew at Harbour View Construction are doing an amazing job. The Charcoal channel wood siding looks great with the black Bauhaus windows and doors. Millwork and interior finishes in progress. Framing just about complete on the QD Beach Lofts project. Looking forward to seeing the massive sliding glass doors installed! Below are a few before and after pics of our latest renovation and addition in St. Margaret's Bay. The renovation consists of a 15'x24' addition, new second level, and roof. It is going to be a dramatic change! Main level framing is complete for our new Quarterdeck Beach Lofts project! The views are stunning and will be even more dramatic from the second and third levels! My tiny assistant and I were on the South Shore this weekend checking out the progress of the new Quarterdeck Beach Lofts. The foundation is poured and the steel frames are up! The rest of the building will be prefabricated off-site, then shipped and assembled in the coming weeks. Can't wait to see it all come together. I made a trip to Cape Breton yesterday to check out the progress of the Lake house. Custom black mahogany windows and doors from BAUHAUS were just installed and look amazing. This house isn't messing around with it's windows and doors! NFA is pleased to announce that we’ve been commissioned to design the expansion of the Quarterdeck Beachside Villas in Summerville, on Nova Scotia’s south shore. Construction has officially started on the new Beach Lofts, which will have a decidedly more modern vibe than the existing Villas. 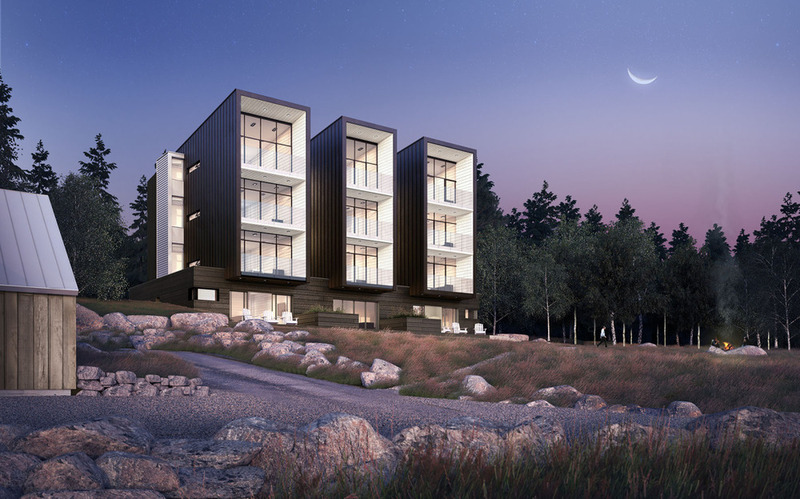 The Beach Lofts will consist of 12 new units perched on the hillside, all with stunning views overlooking the ocean and Summerville Beach Provincial Park. Each unit is designed with privacy in mind – a podium built into the south facing slope supports three wings, separated by stair cores that create a buffer between the units. Punched-in private terraces extend the indoor space outdoors and include window walls, which frame the spectacular views. We like to think of them as “sky cottages”. The top-level units feature a four-panel sliding door, 16 feet wide and 12 feet high. The entire project will be double wall construction for energy efficiency and is being panelized by Lloyoll Construction. The upper portion of the building will be clad in black standing seam metal siding with the stair cores enclosed by cedar slats and the base/lower units in shou-sugi-ban burnt Japanese wood. Check out time lapse video HERE of the crew at Lloyoll assembling panels of the Lake House. 2000 square feet in two days! Custom wood windows from Bauhaus will arrive soon. Bauhaus supplied all the windows for the Fogo Island project in NFLD. Our Cape Breton Lake House is coming together nicely. Prefabricated panels were manufactured by Lloyoll Custom Building on the south shore and delivered to Cape Breton last week. 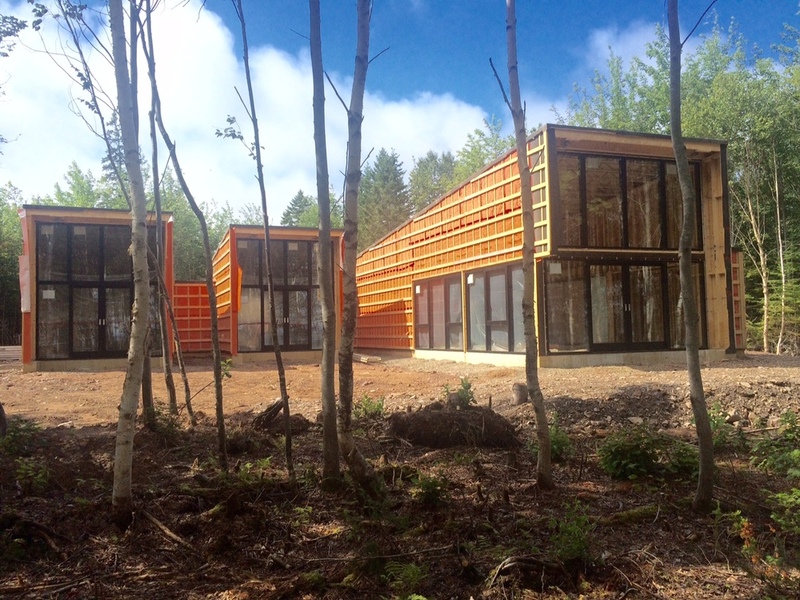 After only a few days on site, the crew erected all the panels for the 2000 square foot summer residence. The wall panels consist of staggered 2x4 studs on a 2x8 plate which eliminates thermal bridging and maximizes energy efficiency. Check out more photos here. CONSTRUCTION OFFICIALLY STARTS ON LAKE HOUSE! The entire build will be recorded with a GoPro. Looking forward to seeing how fast Lloyoll Custom Building erects panels. Stay tuned for more updates. East Coast Modern's latest prefab design is the Beach Pod - 832 sq ft of pure goodness. We plan to ship a few of these bad boys to PEI this summer. The Coast Homes Magazine wrote a nice little article on NFA and East Coast Modern...check it out HERE! East Coast Modern recently engaged our friend at Acorn Art and Photography to document our most recent projects. We are currently working on our new website that will showcase several new exciting projects under 800 square feet. A photo from our recent site visit to East Coast Modern's latest prefab build. Check out more info and photos here.